No don’t worry about nerf darts, just get some blinking leds, that would be cool. Or possibly some lasers, but that would be dangerous. “Who are you? !” would be nice too! I’d purchase one of them as well as the DEFECTIVE TURRETs if you made them too! They’re hilarious! Hope it gives you more idea for your second version. I wait for it to try it myself. OMG That is soooo cool! MUST BUY, I WILL PAY YOU MONEYS FOR ONE! I want one… Will pay $$$! I need to buy this ASWELL ! I need one of these in my life. I would totally buy one. Not kidding. you need to make it so 2 will interact. “excuse me” “coming through!” that and corrupt turrets. Like many others, I will buy one if your making them for sale at any point. I really wanna buy it. Can you answer me on email? What’s wrong with you people wanting absolutely to BUY one. Are you incapable of doing any basic manual work? Even when provided relevant technical details? Instead of waving your money like passive consumers, why don’t you use all the info Jonathan is kindly providing you, and make one yourselves. Buying the parts is simple. Using a soldering iron is simple. Programming an Arduino with the program provided by Jonathan is easy. There’s no complicated mechanical parts. You REALLY want a Portal Turret Plushie? Work for it! Unfortunately some of us don’t have a grandma or someone else who can make the plushie part. I agree that outright refusal to do some very, very simple electronics work is a bit much, but Betsy Ross I am not, so buying at least that portion is my only option. Shoot, the sewing’s the tricky part? I’d never even heard of an Arduino before this post! The sewing’s the tricky part for me. Leigh certainly made it look easy! Your code is very well commented, easy to follow! Thanks for providing it. Great Job! You seriously need to think about massproducing these things. It’s a win win win situation bro’s. Take my money away so that I can has that thing you make! Do want! Very do want! I would totally purchase. The code comments contains all the connections you need to know. I haven’t written any code for the LEDs yet, and it will require a (slightly) more complicated circuit. If/when I create that, I’ll post about how to do it. I’m trying to build one with a friend of mine and I had a couple of questions,which arduino board did you use? This would be my first time using one and I wanted to make sure I got it right! Also, if we went with the BBB, would the code you wrote still work? Thanks and if we get ours working we’ll be sure to send a quick video! I used an Arduino Uno, because it’s what I had handy, but any Arduino that uses an ATMEGA328 should work with the same code. If you’ve never used Arduino before, I recommend sticking with the Uno. 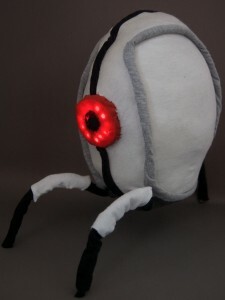 I would definitely buy a turret plushie. Someone suggested making a defective turret plushie as well, and I would definitely buy one of those, too. I wish you actually sold these, I’d definately buy one! I’ll try and have a go at it myself sometime. 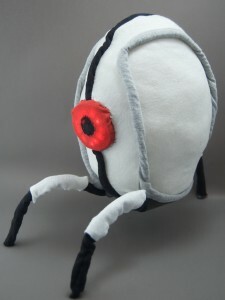 I think if you could mass produce these things you would make a lot of portal fans very happy, especially me. I might be able to sew the plushie part but everything else you said on making the electronics sounds like Greek to me. Please look into making many many more of these! The wiring is explained in the code comments, and there’s nothing much to it: assemble the Wave Shield, attach it to the Arduino, and then attach the sensors so that one wire is grounded and the other goes to the Arduino. The code indicates where to attach it to the Arduino. ah, cool, didn’t see that:) thanks! HOLY CRAP MASS PRODUCE THESE NOW!!!! Seriously, name your price. That is so many kinds of awesome. WANT IT WANT IT WANT IT!!!!! No but really, name your price. My husband and I want to jointly make one. I could figure out the pattern for the plushie, but it would be *easier* if Leigh’s pattern could be posted somewhere. Any word on when this might be available? Thanks! All you peeps wanting to buy one, if you have half the skills (either the sewing or the arduino), you should just find somebody with the other half to do a joint project together! Make two at once: It’s hardly any additional work! Sorry, no timeline on releasing the pattern. Unfortunately, we both have real jobs, and Leigh’s is keeping her busy right now. Subscribe to the RSS feed and you’ll know as soon as I post it. Be sure to send pictures when you’re done! Thanks Jonathan – will do! “ouch, ouch! it burns!” but i dont know what it would be :P a sudden change in temperature? Adding a temperature sensor would be easy. Sell the idea to Valve, become a millionnaire and make millions of happy gamers. This is your destiny. Valve owns the character and the recordings, so they don’t need to buy anything from us if they decide they want to make them. However, I’d be thrilled if they’d like to involve us in some way. Just waiting to hear from them. This is super cool. Love what you done here and love Portal, (and P2 for that matter) and yes, those poor turrets are totally under-loved… Well at least they were until I guess that commercial came along. Typically plushies I’ve encountered have this type of build (I don’t even know what to call those…joints?) for that extra level of sturdiness and flexibility. It would be maybe also interesting to create a turret that has video capabilities, sorta like those stuffed animal Nannycams?…’Cause you know, turrets and babies go hand in hand. I’m definitely going to look into collaborating with someone…even though I lack a sewing machine I do have some basic sewing know-how. The electrical work may be a bit more tricky for me, but I can find someone for that. Thanks for sharing part of the plans for such an awesome toy! Looking forward to seeing the plush patterns so I can get started. PS – You can find me on Steam with this name! 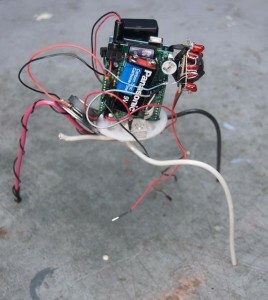 I definitely think it’s possible to make it, but you will need to learn how to solder, and some basic electronics. Fortunately, there’s lots of help on the internet for those things. Also, look into whether there’s a hackerspace near you (you can check on http://hackerspaces.org). Hackerspaces are clubs where people who like to tinker get together to build things. If there’s one nearby, go on their open house night and ask for help! Thanks for the link by the way, I work in Amsterdam and there seem to be quite a lot of hackerspaces there! Hey man, this is simply amazing! I managed to find the sounds you refer to, have read up on and ordered an Arduino, and actually convinced the wife to make the plushie. I hope it looks as good as yours. Can you recommend any good places in Toronto to get the other componants from? I don’t know if Active is still any good. I sure can: Creatron, at College and Spadina. Lawrence and Mary run the place, and it’s a treasure. Tell them Jonathan sent you, they know me there. If you’re in Toronto, you should stop by Site 3 on one of our open house nights, every Thursday starting around 7 (although this coming Thursday probably isn’t a good time, because it’s the night before Maker Faire Toronto). OMG! Please let me buy one! Please! Jonathan, I am very interested in making one of these guys out of fiberglass and incorporating the movements of the side doors as well, is there any way I could get you to correspond with me via email? My models will be full size and I would GLADLY give you one for your help. My email address is sneakily hidden on the contact page. ogmygod you are so awesome. If Valve wants to make something like this, they don’t need any permission from me: I’ve made all the schematics available, and the intellectual property is already theirs. I’ve written to both Valve and ThinkGeek about it, but I have yet to hear back. I doubt I will, to be honest, but it sure would be nice! 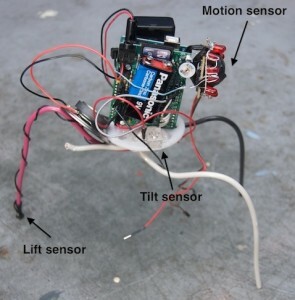 Hi, I’m looking into making a turret myself but am unfamiliar with arduino. I wanted to first download a SPICE program and software that simulates the arduino processor. Is there any that you recommend? I looked into VirtualBreadBoard, AVR Simulator, and Proteus VSM, but I’m really not sure which is the best. Please help!!! Thanks! Sorry, I don’t know of any such software for Arduino. 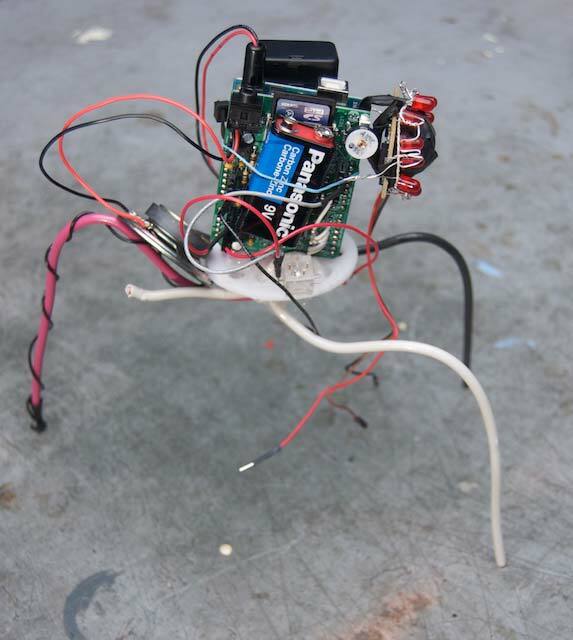 Your best bet is to ask in the forums on the Arduino site.